A tavola non si invecchia – Italian proverb. Food is definitely one of the finest pleasures in life. It is in my life, anyway, ever since I began cooking for myself when I left home and I embarked on a wonderful culinary journey. Would you believe, as a child, I wanted to open a restaurant? I remember drawing out the floor plans and menus of my future business. Ah, the dreams of youth! I’m no expert by any means – I am completely self taught. I don’t have one of those nostalgic family histories of lovingly being taught how to cook, or what ingredient goes with what, or long meals discussing philosophical thoughts over a glass or two of wine. The food I grew up with was very basic, unseasoned, but hearty: meat and tatties sorts of meals. It was food to keep you physically alive, but not for pleasure. When it came to discovering new foods, flavours and textures, I was on my own. Sometimes I feel like I am blindly stumbling through the food world, every now and again finding a gem of an ingredient, recipe or technique. I absolutely love trying new things, the more exotic and unusual the better. So imagine my delight when I was contacted by the Italian company Ufuud. Would I like to try out their new online Italian food shopping site? Yes please! Italy is synonymous with good food; it’s just one of those facts in life. 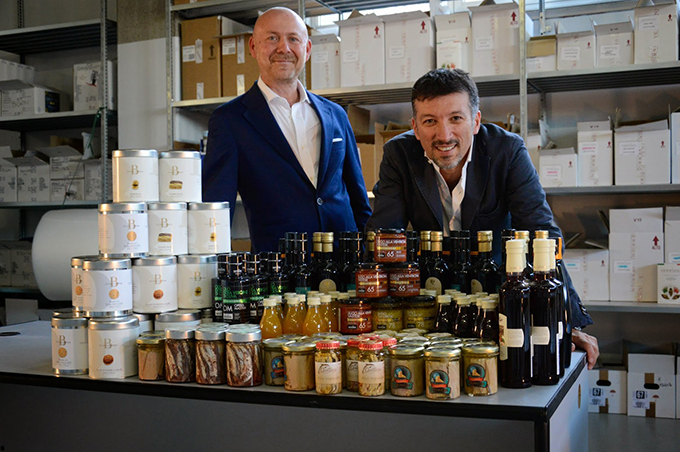 However, Ufuud directors Cipriano Moneta and Christian Prazzoli found that more and more, especially outside Italy, Italian food, both in restaurants and in shops, was Italian only by name, not by quality. Discouraged by the lack of availability of fine, quality Italian produce at the supermarket and local food stores they decided they had to set things right. 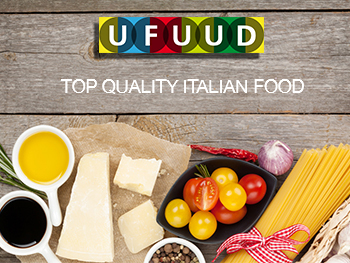 They set up Ufuud with an aim to create a channel for food-lovers who are genuinely interested in high quality Italian produce – a place where us foodies can obtain a highly selective range of real Italian products. In many cases, these products bear special certificates (DOC, DOP, etc.) testifying to their quality and provenance. Their mission is to foster greater awareness of Italian cuisine around the world and help safeguard their ancient traditions. The first thing I noticed about the Ufuud website was how clean and fresh it looked. Setting up an account was simple and straight forward, and so I set to the task of shopping. For a new company there is quite a wide variety of products available: cold cuts, cheese, pasta, rice, flours, cereals, legumes, store cupboard items, sweets and much more. They select only the finest, unique Italian food excellence from every region, sourcing their products from small independent food producers. 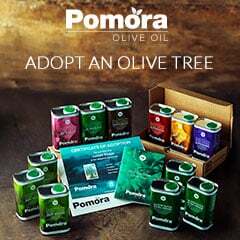 Many are organic farmers, like the Paglione farm business, producers of the ready-made olive and caper tomato sauce I placed in my shopping basket. How do I know this? 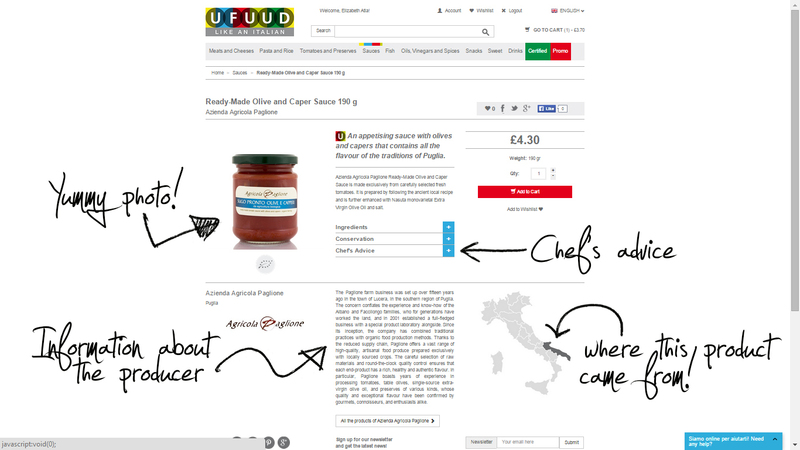 Because each product page contains information on the producer, a map showing where in Italy the product came from, storage tips, an ingredients list and chef’s tips – something very handy when it comes to planning an Italian meal. (Click on the image below to open up a larger version). To guarantee that each product reaches you in its best quality, Ufuud has its own special cold storage units and warehouses. All of their produce, dry or freshly picked, is brought to be processed and individually packaged ready to be delivered directly to the customer’s door in the shortest time possible. I live on a remote island archipelago in the middle of the North Sea (midway between Iceland, Norway and the Scottish mainland). We don’t get next day, or even two day delivery up here. Couriers, remarkably swift down there on the mainland, are subcontracted to local delivery companies up here. Our couriers are a bit more laid back, especially when it comes to us very remote country dwellers. Our parcels get delivered when they get around to it, no hurry. So I adjusted my Italian food order accordingly (no perishable items!). For those on the mainland this shouldn’t pose a problem as Ufuud pack everything in a specially designed cooler which keeps perishable items at the optimum temperature for up to 72 hours. Ample time for delivery. 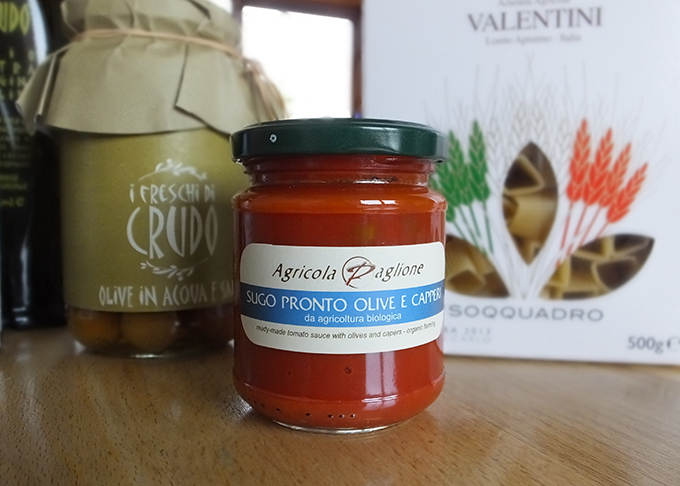 This is what I ordered: 190 grams of organic ready made tomato sauce with capers and olives (Agricola Paglione); 500 grams soqquadro (square!) pasta (Verrigni); 500 ml extra virgin olive oil (Crudo); 550 grams olives in salt water (Crudo); 250 ml balsamic vinegar of modena (Giusti); 180 grams stuffed baby aubergines in extra-virgin olive oil (Vastola); 75cl amber beer (La Morosina); 250 grams squid’s ink spaghetti (Filotea); 100 grams dark chocolate with cinnamon (Antica Dolceria Bonajuto) and 50 grams 100% cocoa mass chocolate (Antica Dolceria Bonajuto). The parcel arrived ten days after I ordered it, but I suspect that was due to local delivery schedules rather than the mainland couriers. Each item was well packaged in coloured paper or bubblewrap, and the entire parcel was inside a keep cool polystyrene cooler. So, this Sunday past we had an Italian feast for our lunch. The tomato sauce and square pasta were ordered because I wanted to serve something to my young children children that would appeal to them; something a little more unusual (they’ve never had square pasta before). The pasta and sauce were served simply with fresh, locally grown organic Italian flat-leaf parsley from my veg box and plenty of the Sandstinger cheese I’d made six months ago on cheese making course at Britain’s most northerly cheese producer – Shetland Cheese Ltd. I’m rather proud of my cheese, I am! Following the instructions (written in Italian) on the box, I cooked the pasta for 7 minutes, until al dente. The tomato sauce was simple but delicious. Unlike most ready-made sauces sold here in the UK the ingredients list for this sauce is very short: tomatoes, olives, capers, extra-virgin olive oil and salt. Nothing else is needed when you start with high quality organically grown ingredients that are bursting with their own flavour. The children commented that the texture of the pasta which was harder than they are used to, but they still cleared their plates. Personally, I preferred the harder al dente texture, and the shape of the pasta held the sauce very well. The olive oil and balsamic vinegar were combined to make a dip for some home made ciabatta bread. I learned about this dip on the one and only trip I’ve ever made to Italy, to the island of Sardinia over a decade ago. The gorgeous little Italian-made ceramic dip bowl you see was given to me as a thank-you from the teachers at our local school for my helping them out on a cooking event last year. 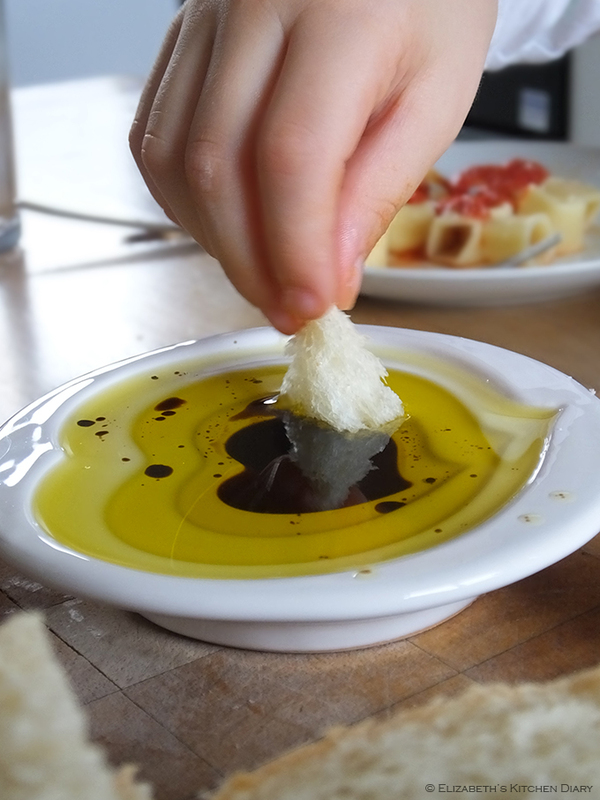 My children are quite fond of dipping their bread into olive oil/balsamic vinegar (that’s our youngest – age 5 – demonstrating above). This particular olive oil from the Ufuud website, in its dark green glass bottle and little jug handle was vastly different than the supermarket oil I tend to buy. 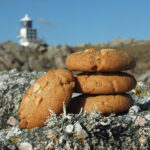 It was rich and superbly flavoured; much stronger in olive flavour than we’re accustomed to – I prefer it, to be honest! It paired excellently with the high quality balsamic vinegar, with its geographical protection of origin certificate. Sides included green olives and some baby aubergines stuffed with garlic, oregano and hot pepper preserved in extra virgin olive oil. Both of these were lovely, and we scoffed with delight. There was much mmmm-ing and aaaah-ing from all of us. To wash it all down I included a large bottle of Italian red beer in the order, 75 cl, enough for both my husband and I to have a large glass or two. Note, our youngest, pictured above, is drinking apple juice, not beer! 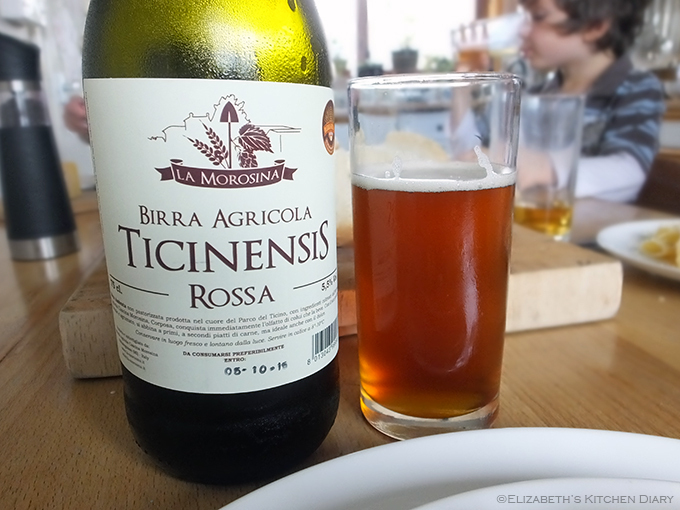 This was a quite a strong flavoured, cloudy beer which went very well with the pasta. Investigating the pairing of beer with pasta after the event, I discovered that the general consensus is that for a simple pasta dish with tomato sauce an amber beer is best. Phew! To finish things off we shared a few squares of chocolate. Now, this chocolate made by Antica Dolceria Bonajuto is like no chocolate I have ever tried before. Made to a traditional recipe dating back to when the Spanish introduced it to Europe in the XVI century who in turn learned it from the Meso-American people, this chocolate contains three simple ingredients: cocoa mass, sugar and cinnamon. 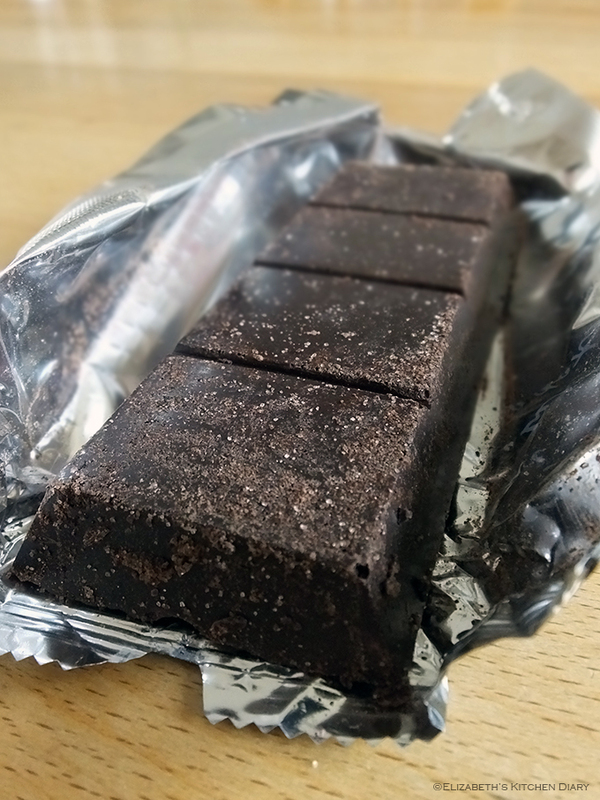 It’s not a melted chocolate poured into a mould like many commercial bars, rather, its crumbly texture and clearly visible grains of sugar indicate this chocolate is prepared by combining the ingredients and pressing them together. I really enjoyed it, but it’s not the sort of chocolate you could scoff a whole bar of in one go (a good thing, surely!). The remainder of the food shop, namely the squid’s ink spaghetti and 100% cocoa mass chocolate will be saved for another day for other recipes. Watch this space! All in all I’m really impressed with the variety and quality of the products on the Ufuud website, the fact they are promoting local (to them! ), small scale producers and the fact that their high quality Italian food can easily end up on my table here in the middle of the North Sea. They are a treasure trove of real Italian food. The prices are rather out of my usual budget, but you’re paying for quality artisan produce here, so you can expect things to cost a bit more. Ufuud are one of those culinary gems I mentioned earlier, and I will definitely be shopping with them again. Why not have a browse through their website yourself? Ufuud can also be found on Facebook, Twitter and Instagram. 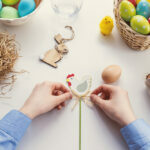 WIN A VOUCHER OF £50* OF FOOD GOODIES! Would you like to have your own Italian feast? Ufuud have kindly offered the opportunity for one of my EU readers to win a shopping voucher code worth 50 of your local currency. So, if you’re in the UK it’s £50, if you use the euro it’s 50 €, you get my drift? On top of this fantastic prize they’re offering an extra bonus prize to the winner, just in time for Christmas! For your chance to win a 50 (your EU currency) voucher code with Ufuud PLUS a fab bonus prize enter using the Rafflecopter form below. Come back and tweet about the giveaway every day for more chances to win! This giveaway is open to EU entries only. Entrants must be age 18 or over. The winner will need to respond within 7 days of being contacted; failure to do this may result in another winner being selected. The prize is offered and provided by Ufuud. The prize is a 50 (your EU currency) voucher code with Ufuud PLUS a fab bonus prize. There is no cash alternative and the prize is not transferable. 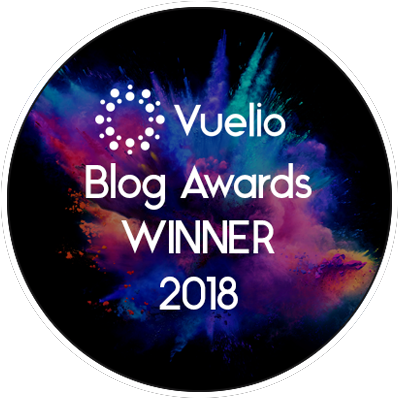 By entering you consent, that if you win, to having your contact details shared with Ufuud for the purposes of creating your unique voucher code. Only the winner’s details will be shared. Closing date is midnight on Monday 1 December 2014 (GMT) and the winner will be announced that day. Visit the Ufuud website, have a browse and then come back to answer the Rafflecopter question. Check out my giveaways page for other fab prizes! Elizabeth’s Kitchen Diary was sent a voucher to spend at Ufuud. All opinions expressed are our own. This is not a paid post. The Balsamic vinegar. I will use it to roast my vegetables. I’ve never seen square pasta before, would love to try it. I’d love the Handmade Panettone with chocolate and figs. the square pasta since its different. This would be prefect for christmas! 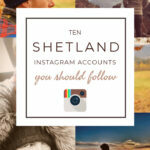 must be challenging for you with all the parcels a popular food blog receives! I would choose some Marons Glace and some proper Balsamic vinegar. I love the sound of the Bronze-Extruded Soqquadro Pasta 500 g Verrigni as it is different and would be fun to try! Pistachio and Walnut Flavoured Cantucci – I’d just eat it! 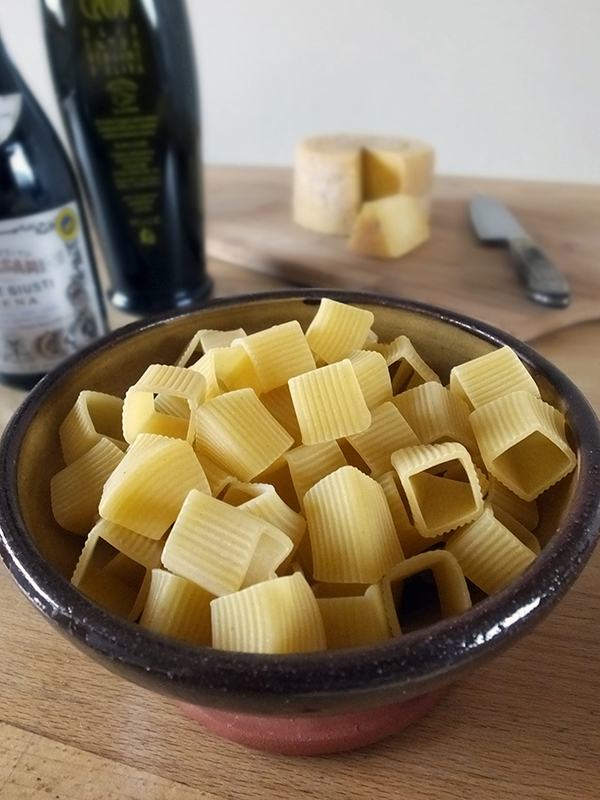 I’d like to try this – Bronze-Extruded Soqquadro Pasta 500 Never had square pasta before! The pancetta, I’d probably use it to make a nice pasta sauce. Thanks for the chance to win this. The Cold cuts look great!!! The carnaloni to go in a risotto.yummy. I’d probably make the classic spaghetti alla putanesca with the Spicy Marinated Anchovies! I would love to try the aubergine sauce and would make a pasta dish with it. Olive oils, I use it in everything. Definitely the acacia honey, I have honey with so much and love new varieties! I would like to try http://www.ufuud.co.uk/en/coppa-regina-p-d-o-cured-pork-neck-700-g-781.html. It looks great sliced with cheese and bread. I would like to try their Acacia Honey. I would drizzle it over some freshly baked, crusty bread with butter. I would try the square pasta as it’s different and fun! I’d choose the Prosciutto Stagionato Tartufo Rosa and have as a starter for Christmas Day with fresh figs. The Coppa Regina PDO Cured Pork Neck looks delicious! I would put it out on our buffet table on Christmas day. I’d love to try the square pasta in a bolognaise, mhmmm! L’Oro del Parco Extra Virgin Olive Oil 500 ml for salads and bread dip! Salami with Barolo Wine…two favourites blended together! Would serve with home made rolls and salad veg from my garden..
Love to try the various olive oils.. The cold cut meats look great! Pesto Genovese – I’d have it just over pasta. Nice and simple. 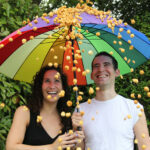 I would love to try the Orange Almond Amaretti Biscuits, they sound soooo yum! 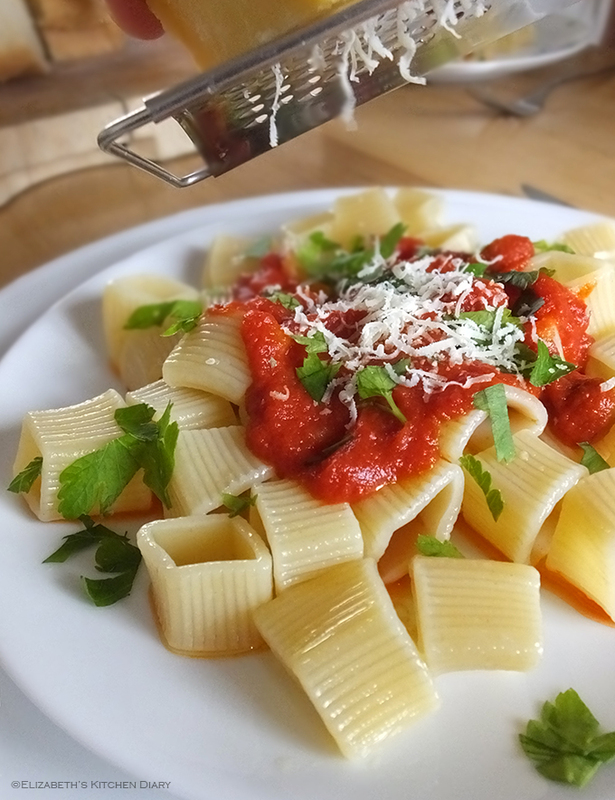 The square pasta looks amazing – so unusual, and appetising! Lovely review! 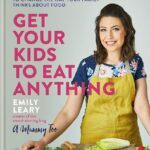 It all looks delicious, I’d be interested in trying their buckwheat flour (http://www.ufuud.co.uk/en/food/flours-cereals-legumes/flours/farina-di-grano-saraceno-500-gr.html) as I’ve started experimenting with it in gluten-free baking. I would choose the Duetto Rustico Balsamic vinegar as love dipping in bread. I want to try the chocolate. It sounds unique. I would try the square pasta, so unusual my grandchildren would love it. I Would love to try the Really top quality Balsamic Vinegar! !Only had the supermarket stuff! !bet it tastes completely different for all my dips and bread I love!! I’d like to try their Carnaroli Rice (Arborio) to see if I can raise my risotto recipes to great heights. i would like to try the cured ham, would do a mixed starter with some homemade breads, dipping oil, and mozzarela…..and also do a nice pizza with it on. Square pasta # exciting and how good does that chocolate look? The chestnut and dark chocolate paste sounds delicious! That lovely cinnamon tinged chocolate sounds delicious. I love dried pasta, there’s a certain texture to it that’s missing from fresh. I’ve never seen that square one before, so that’d be my choice, to make some tasty pasta dishes. I would like to try the Gold-Extruded Fusilloro Pasta and make a lovely gooey cheese and tomato based pasta dish. Natural Pancetta ca. 1 kg looks so yum! The square pasta looks scrummy!! Any of the cured meats…yum. Cold cuts, I love them all! One of my favourite starters. we like pancetta and usually have it with pasta, but I think I would try something different .. not sure what, maybe with thick cream on fluffy jacket potatoes. But, I would really like to try something ‘different’ just dont know what? Now I’m loving the look of these products! Ps: I have the same ceramic dip dish – love it! L’Oro del Parco Extra Virgin Olive Oil 500 ml I adore olive oil – cook everything with it!! Id really like to try the soqquadro pasta! I’d like the Tartufo Rosa 30 month cured ham and I’d use it to wrap chicken. Their range of fruit juices look very refreshing. I would use the pancetta with a nice arrabiata sauce and pasta! What a great post, and a wonderful shop, too, thank you! I would like to try the Arborio rice and make a tasty risotto with it – as risottos are my favourite dish! Riccardo Giusti 3 Gold Medals Balsamic Vinegar 250 ml sounds pretty lovely!!!! too much choice! Great review Elizabeth and fantastic photos as usual. I really loved the produce I received and will be writing up about it shortly. My photos, sadly aren’t even half as good as yours. The chocolate is very strange, but I quite like it. I ordered the same as you. I’d like to use the Bronze-Extruded Soqquadro Pasta for my chicken and mushroom dish! I would love to try the Caper and Olive pâté. I bet it would taste amazing on melba toast with soft creamy goats cheese! Both my husband and myself both love eating and cooking Italian food. I would love to try the Soppressina Salami with Barolo Wine. It sounds wonderful with the Barolo Wine added. I would use it for Antipasto and also to add to a rich red pasta sauce. Panchetta, I would have to read a recipe book, but sounds great. I’d go for the balsamic vinegar; I’ve never tried the proper stuff before, so the “”Duetto Rustico” IGP Balsamic Vinegar from Modena 250 ml” sounds fantastic. I’d put it with some high quality olive oil and use it for dipping with some artisan bread. Yum! Prosciutto Gran Sapori I would have this on my cheese board for when my friends and family come over. The pancetta, I’d use it to make a lovely pasta sauce! Coppa Regina PDO Cured Pork Neck looks lovely!! I love the sound of their Sauce with Matured Prosciutto Crudo and would make a delicious pasta dish with it! Thank you!